Quaker Chewy Granola Bars and Dipps Variety Pack, 58 count only $7.27 shipped! Running low on snacks? This is a great stock up price on Quaker Chewy Granola bars! 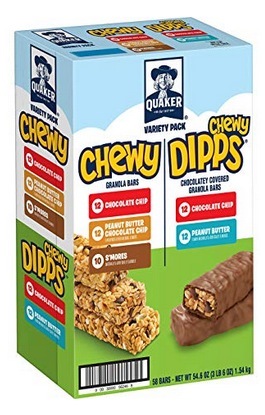 Amazon has these Quaker Chewy Granola Bars and Dipps Variety Pack, 48 count for only $7.27 shipped when you clip the 25% off e-coupon and checkout through Subscribe & Save! That’s like paying just $0.15 per bar, shipped, which is a great stock up price! « Let’s Go Fishin’ Under the Sea Game just $2.99!